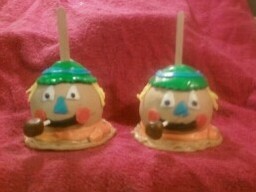 I made these autumn candy apples to celebrate this time of year. 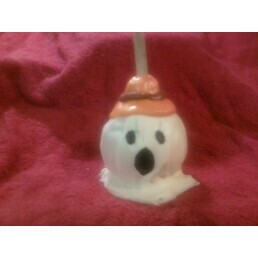 For the Pumpkin Candy Apple, I dipped the apple in orange candy melts and decorated it with fondant. For the Scarecrow Candy Apple, I dipped the apple in peanut butter melts and also decorated it with fondant. 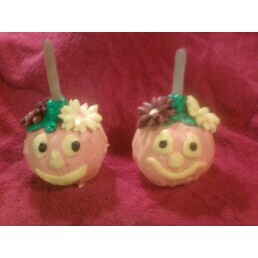 Oh Sandy, I adore these Fall themed candy apples! They are great as Halloween treats or for a wonderful harvest party. The detail you've created is so cute and really just makes these apples a true delight. You didn't mention what you used to cover the Ghost candy apple. Is that white chocolate, or is it all fondant? I'm always so glad when you take the time to upload your creations to the site. They really add to the website, and I know other visitors love them as much as I do.